Awami League president and PM Sheikh Hasina has been elected unofficially in Gopalganj-3 constituency. Meanwhile, the opposition parties Oikyafront and BNP have rejected election results. DHAKA: Ruling Awami League led by Prime Minister Sheikh Hasina is said to have taken massive leads in the violence-marred 11th parliamentary polls in Bangladesh. The AL-led alliance is said to have won 24 seats and is leading in 18. Awami League president and PM Sheikh Hasina has been elected unofficially in Gopalganj-3 constituency, according to Election Commission Secretary Helal Uddin. Meanwhile, the opposition parties Oikyafront and BNP have rejected election results. At least 14 people were killed in poll-related violence on Sunday as voting began across Bangladesh amid allegations by the ruling Awami League and opposition Bangladesh Nationalist Party (BNP) of attacks on supporters and candidates. The voting, which began at 8 AM (local time) in the morning with Prime Minister Sheikh Hasina appearing as the first voter in Dhaka centre from where her nephew and party candidate Fazle Nur Taposh was a contender, ended at 3 PM. The counting of votes is currently underway amid tight security arrangements. While Hasina is seeking re-election for a fourth term as the prime minister, her rival ex-premier and BNP chief Khalida Zia, who is reportedly partially paralysed, faces an uncertain future in a Dhaka jail. Schools and colleges across Bangladesh were turned into makeshift polling centres for the day where people stood in the queue to cast their vote even before the election opened. Meanwhile, violence marred the polling in parts of the country with media reports putting the death toll at 12. Dozens of people were wounded in the poll-related violence. 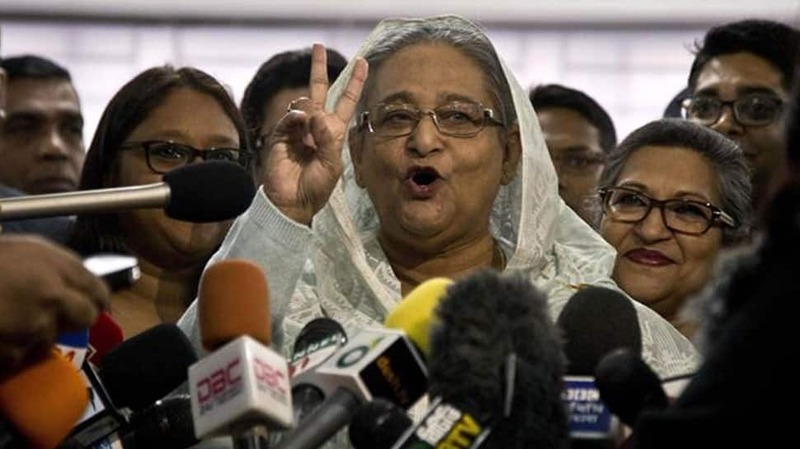 The 11th parliamentary poll is the first fully competitive general election in a decade since 2008 while it is widely expected to be won by the Awami League of Hasina, who is likely to be the country's first premiere for the fourth terms. Citing security reasons, authorities temporarily blocked mobile data services and slowed down the internet. According to the Election Commission, 1,848 candidates are contesting for 299 out of 300 Parliament seats. The polls are being held at 40,183 polling stations. Voting was suspended in one seat due to the death of a candidate. Zia, serving a 10-year prison term on graft charges, has been barred from contesting the polls while Rahman is living in London. As of now, Awami League wins 20 seats, says Election Commission Secretary Helal Uddin Ahmed. Lakhsmipur 1 is taken by Awami League’s Anwar Hossain Khan. He bags 185,438 votes. Awami League’s s Farukh Khan bags 30,3168 votes in Gopalganj 1. BNP’s FE Sharfuzzaman gets 57 votes. Meanwhile, Mymensingh 8 is taken by Jatiya Party’s Fakhrul Imam. He bags 156,769 votes. Awami League’s Jewel Areng takes Mymensingh 1 with 258,923 votes. Independent candidate Shahid Islam wins Lakhsmipur 2 with 256,784 votes. Awami League's A K M Bahauddin is declared winner of Comilla 6 constituency. He gets 296,300 while Mohammad Amin Ur Rashid, BNP candidate, gets 18,537. Former president Hussain Muhammad Ershad wins Rangpur 3 with 142,926 votes while his nearest candidate BNP’s Rita Rahman gets 53,089. Awami League’s Simin Hossain Rimi wins Gazipur 4 after bagging 203,258 votes. His close opponent Shah Reazul Haq of BNP gets 18,582. Awami League’s Sheikh Fazlul Karim Selim wins Gopalganj 2 with 281,909 votes while BNP’s Md Sirajul Islam Siraj bags 286. Oikya Front and BNP have rejected poll result. The alliance says they will seek re-election under non-party government soon. Awami League president Sheikh Hasina gets 229,539 votes while her closest opponent SM Jilani, of BNP, bags only 123. Unveiling results of all 108 polling centres in Gopalganj 3, CEC says, "She won without competition as there was no opposition." Awami League president and PM Sheikh Hasina has been elected unofficially in Gopalganj-3 constituency, EC Secretary Helal Uddin says. Awami League extends lead in Khulna 5 constituency after the counting of votes at 46 polling centres. Awami League candidate Munnujan Sufian has taken a massive lead in Khulna 3 constituency, says Returning Officer Md Helal Hossain. Dhaka Tribune cites Returning Officer Md Helal Hossain claiming that Awami League candidate from Khulna 2 Sheikh Salahuddin Jewel is leading in the constituency. Ruling Awami League candidates ahead in Khulna 2, 3 constituencies. According to Bangladesh media reports, at least 14 persons have fallen victims to violence across the country so far. Rahman Manna alleges police sealed off voting centres, opposition polling agents were expelled and polling was rigged. Voting at the polling centre in the Regional Public Administration Training Centre (RPATC) under Chittagong 9 constituency was suspended for six hours till 2 PM after EVMs malfunctioned, reports Dhaka Tribune. The election saw opposition candidates boycotting elections in at least 43 constituencies; 42 of who were Jatiya Oikyafront runners. Allegations of vote rigging, election clashes, intimidation and irregularities also came in from several other constituencies and capital Dhaka city, according to Bangladesh national media. Reports of casualties came in from Cumilla, Chattogram, Sylhet, Rajshahi, Dinajpur, Rangamati, Cox’s Bazar, Bogura, Noakhali, Narsingdi and Gazipur – where at least 12 people died. BNP Secretary General Mirza Fakhrul Islam Alamgir says the government is using the administration tools to turn the elections into a mockery, reports Dhaka Tribune. According to Dhaka Tribune, at least 12 people have been killed in poll-related violence across the country. Election officials have started counting votes at various counting centres across the country amid tight security. According to the Election Commission, counting of votes will begin at 4 PM. According to the Election Commission, polling has now ended in Bangladesh.